The uniquely designed illusion side table by Essay gives the illusion that your coffee table is really a floating tablecloth. The transparent side table is a unique design, handmade in transparent acrylic. The design focus is shaping to mimic the way a clear plastic tablecloth might hang. The result has you looking for an invisible table underneath the tablecloth of mistaken identity. As kids, who didn’t want to be a magician and impress our friends, family and others at our undisputed superior skills. There is something about magic and illusion that persists today with quite a few talented people regularly doing their illusion on TV. These skills take years to hone and perfect, but most of us don’t have the time or inclination to practice. We want immediate magic and illusion skills to amaze visitors to our house. 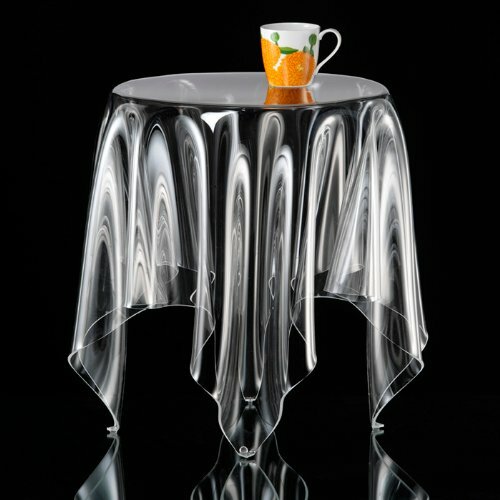 So why not grab this acrylic illusion side table and have a little magic rub off on you with its tablecloth pretending unique design by John Brauer. It isn’t magic. It is an illusion which will have people looking twice at your home decoration and passing on kudos to you for your good taste in furniture. The table is made by Essey in transparent plastic and is coffee table size. It is a small table which is difficult to see from a stand-alone picture. But then any invisible illusion side table would not be doing its job if it were easy to see now would it? We think the design is a clever idea and offers a lot from an aesthetic point of view. Each clear coffee table is handmade to make it truly unique. Can be used as a side table or a coffee table. Looks like the table’s levitating with its clear tablecloth. Perfect furniture for first impressions. It’s very sturdy and gorgeous.